Still it is possible to find surprising new things on the market in Latvia. Recently Mr. Uģis Ķēniņš provided me a scan of a postcard with an earlier not seen provisional marking of Rauna. He had the opportunity to buy this on the monthly held market for collectors in Riga (10 October 2013). The postcard is sent from Wenden (Cēsis) to Rauna parish and is applied with several interesting markings. 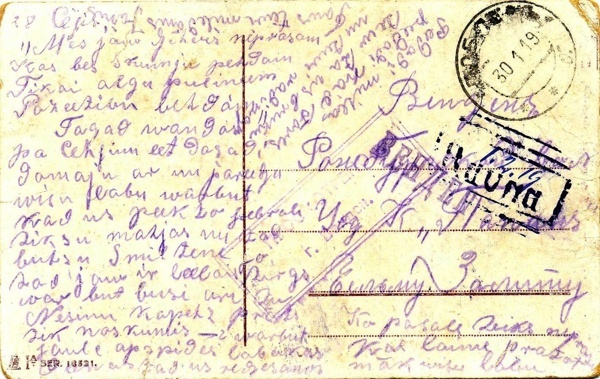 The circular postmark with the date 30 1 19 is a “dumb” (partly made illegible) old Russian postmark “ДОБЛЕНЪ б” (Dobele), a postmark remaining at the Wenden post office from the time during WWI in 1915 when the Dobele post office was evacuated to Cēsis. A second Wenden marking is the single line mark in Russian – ВЕНДЕН which is seen on mail from this time in two different shapes one larger with the length of 26 mm and one smaller with the length of 19 mm – this on the actual postcard is the larger one. Further there is a boxed censorship marking “ПРОСМОТРЕНО г. Венден.” (inspected in Wenden). 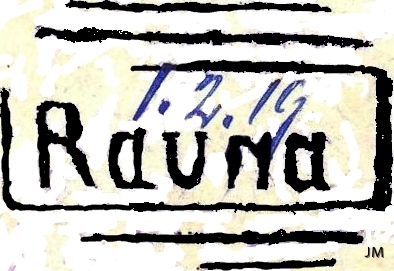 At last we have the arrival marking of Rauna, the earlier not seen provisional mark – Rauna within a rectangle (32 x 20 mm) and with two horizontal lines above and below with the hand written date 1.2.19 within. The text on the card is in Latvian but the address is written in Russian. Many thanks to Uģis showing this unique item.